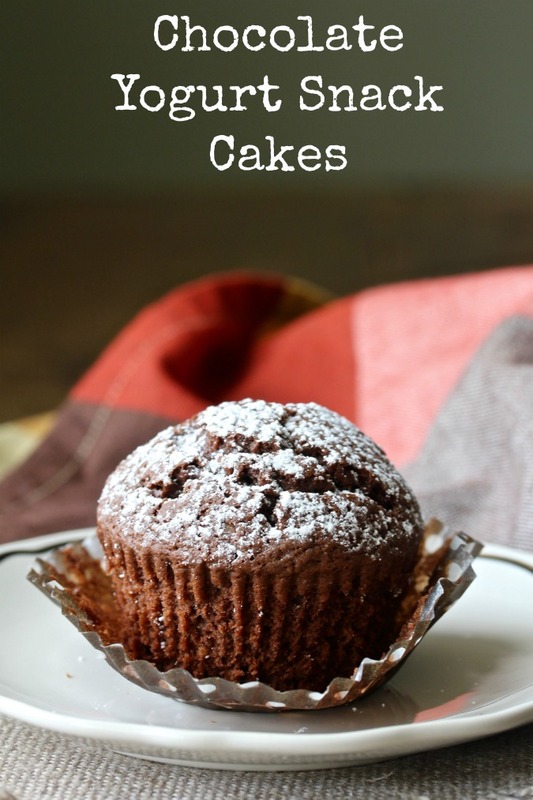 These Chocolate Yogurt Snack Cakes are so light, tender, and not overly sweet. They would even be appropriate for breakfast topped with whipped cream and fresh raspberries. They are excellent with coffee or a cold glass of milk. I topped these chocolate yogurt snack cakes with some sifted powdered sugar, which I think made them really pretty. I don't know why, but I always have such a hard time finding plain full-fat yogurt. I'm pretty sure it's because there are now thousands (okay, maybe I'm exaggerating a teeny bit) of brands and flavors of yogurt, and all of them are fighting for shelf space. I hit three stores before finding the plain yogurt! I probably could have used sour cream, but then I'd be lying here by calling these yogurt cakes. 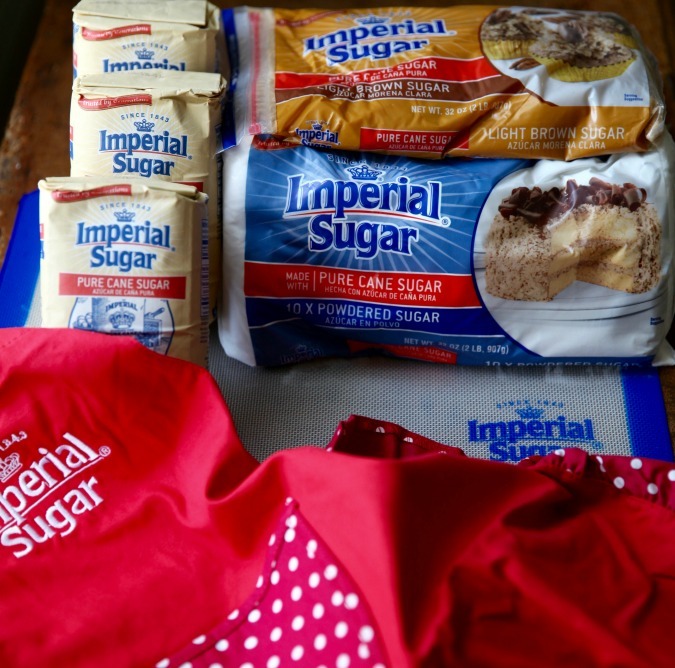 One ingredient I won't have any trouble finding is Imperial Sugar, because they sent me (and the 70+ bloggers participating in #choctoberfest) a year's supply of granulated, powdered, and brown sugar, plus an awesome baking mat and the cutest apron. Since 1843, Imperial Sugar has been at the heart of family traditions and celebrations. I used the granulated sugar in these snack cakes, and then topped them with a sprinkling of the powdered sugar. If you're interested in winning a year's supply of sugar, plus many more goodies (a prize package worth $450), be sure to check out this post to enter the contest. Disclosure: I received product for participating in #choctoberfest. I did not receive payment. All opinions are mine. After the recipe, be sure to visit the rest of the #choctoberfest recipes for today. Preheat your oven to 350°F. 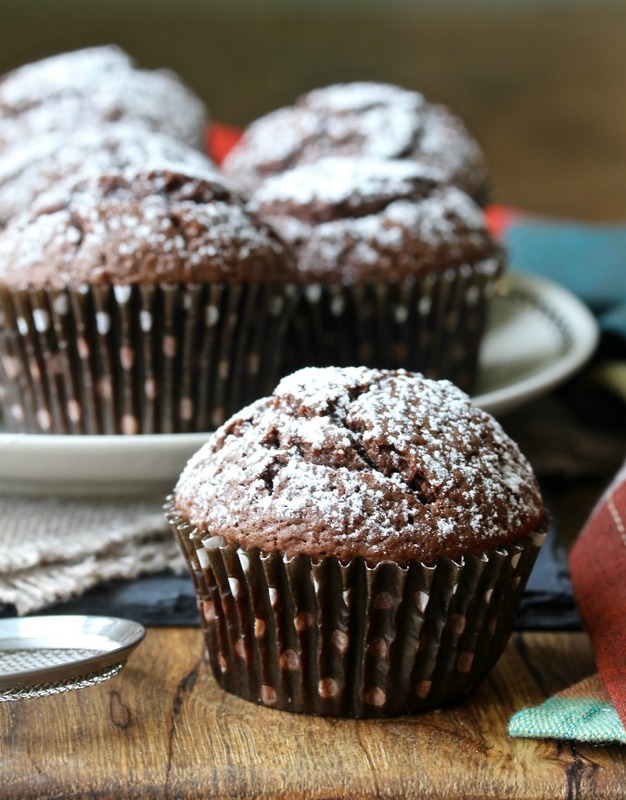 Line a 12-cup muffin pan with paper cupcake liners. In a heatproof bowl set over simmering water, or using a double boiler, melt the chocolate with 1/4 cup of the oil, stirring constantly. Once the chocolate is melted and smooth, remove it from the heat. In a medium bowl or large measuring cup, mix the remaining 1/4 cup oil with the yogurt, sugar, eggs, vanilla, and almond extract. In a large bowl, whisk the flour, baking powder, and salt. Add the yogurt mixture. Stir until just combined, and then add the melted chocolate and stir until just smooth. 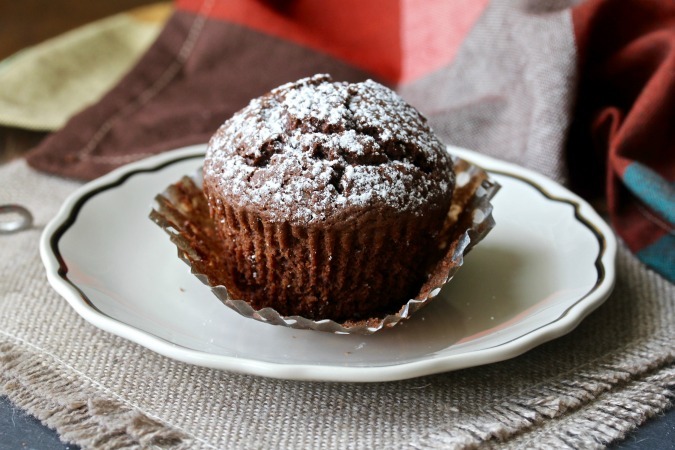 Portion the batter among the muffin tin cavities, and then bake for 15 to 20 minutes, until the muffins are barely set in the middle and a tester or toothpick comes out clean. Remove from the oven and cool on a wire rack. Sprinkle with the powdered sugar. Store leftovers in an airtight container for up to four days. Adapted from Sweet Life in Paris from David Lebovitz via Smitten Kitchen for the Avid Baker's Challenge. you are on a roll.. on a cupcake, on a bread, on shrimp cocktail, you are just a walking inspiration!!!!! I can't resist these events, lol! Ooh, I bet these are so moist and scrumptious!!! Yeah, plain, full fat yogurt is what I love for baking and it IS hard to find! 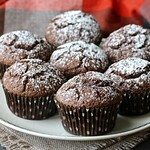 I love a good chocolate muffin! These look yummy! Awesome work Karen! Living here, we're quite accustomed to using oil instead of butter in desserts, so we're definitely trying this out. Thanks Mirella! I think you will be really happy with these. I love baking with yogurt, and these look amazing Karen! 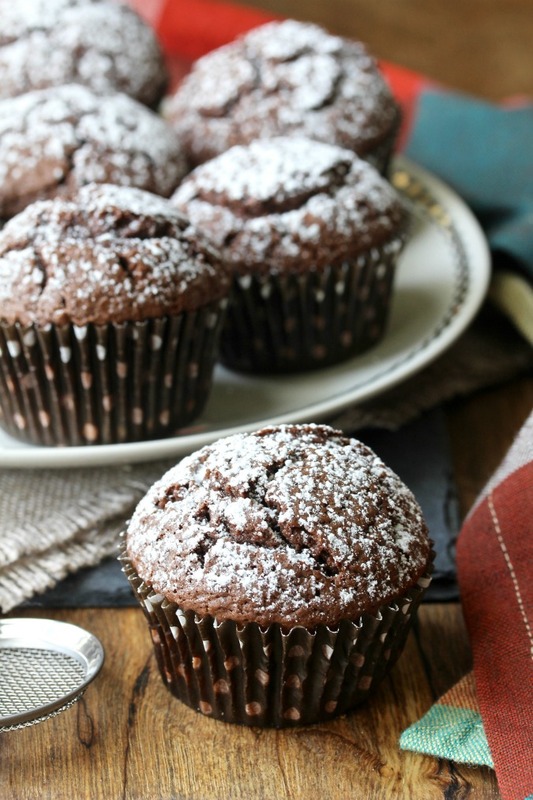 Chocolate can be paired with just about anything, it's always good! And thanks for linking up at Friday Frenzy Link Party! I hope you link up again next week :) PINNED! These look delicious. And I totally love the idea of serving them for breakfast with yogurt and raspberries - yum!